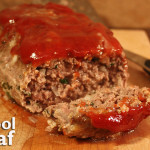 Old School Meatloaf Recipe- Moist, tender, and flavorful traditional meatloaf! Place the ground beef, onion, breadcrumbs, Parmesan, parsley, milk, garlic, eggs, salt, and pepper into a mixing bowl. Using your hands, combine all of the ingredients. DO NOT mix too much it will make the meatloaf tough. In a small bowl, mix together the ketchup, brown sugar, dijon, and Worcestershire sauce for the glaze. Form the meat mixture into a loaf pan or on a baking sheet. Spread about 1/3 of the glaze over the top of the meatloaf. Remove the meatloaf from the oven. Spread another 1/3 of the glaze, and cook for an additional 15 minutes. The internal temperature should read 155ºF. You can either top with the additional glaze or save it for serving on the side.